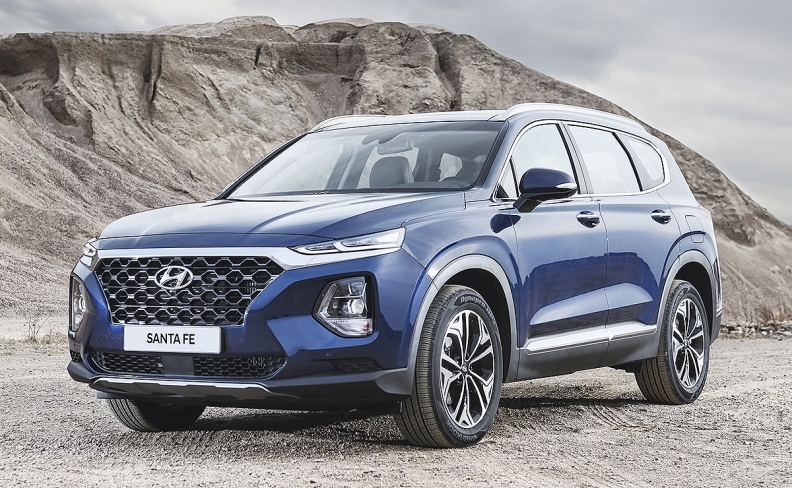 Canadian Hyundai dealers will have plenty of Santa Fe models to offer their customers later this year as the automaker keeps selling the current seven-seat XL model alongside the redesigned 2019 vehicle set to arrive at the end of summer. Hyundai Canada spokesman Chad Heard didn’t say how long the automaker would continue to offer the outgoing seven-seat Santa Fe XL, which will be equipped only with the current 3.3-litre petrol V-6 engine. It will become the only remaining Santa Fe with a V-6. The new 2019 Santa Fe five-passenger model will have a naturally aspirated or a turbo four-cylinder petrol engine. The new 2019 Santa Fe three-row model will have a four-cylinder turbo diesel. There will be no petrol seven-passenger 2019 Santa Fe and no diesel five-passenger 2019 Santa Fe — for now. “SUVs continue to be in high demand and the three-row segment is a growth opportunity for Hyundai,” Heard said of the reasoning behind keeping the older model available for a while. Pricing for the 2019 versions have not been disclosed. The 2019 Hyundai Santa Fe is the brand's first diesel offering in Canada. It also brings Hyundai halfway to its goal of eight new or re-engineered crossover debuts by 2020. The diesel Santa Fe houses a 2.2-litre CRDi turbodiesel engine that churns out nearly 200 hp. The other options are a 2.4-litre inline four-cylinder GDI engine with an estimated 185 hp, and the turbocharged 2.0-litre four-cylinder engine with an estimated 232 hp. Each engine is matched with the brand's new eight-speed automatic transmission. The diesel option comes with advantages such as better fuel economy, towing capacity and torque, the company says. The brand is pushing the Santa Fe as a family vehicle. One family-oriented perks this year is the addition of rear seat occupant alert, which Hyundai is debuting with the Santa Fe. It’s mean to prevent infant deaths from overheating when left in the vehicle. Hyundai says the system "monitors the rear seats using an ultrasonic sensor that helps to detect the movements of children and pets." The system, Hyundai said, "first reminds drivers to check the rear seats when exiting the vehicle with a message on the centre instrument cluster display. If the system detects movement in the rear seats after the driver leaves the vehicle it will honk the horn, flash the lights and send a Blue Link alert to the driver's smartphone via Hyundai's Blue Link connected car system." Total Santa Fe Canadian sales in 2017, which includes Santa Fe XL and Santa Fe Sport, were 28,402, down 12 per cent from the 32,263 in 2016. As part of the redesign, the smaller five-seat and larger seven-seat Santa Fe models will lose their names of XL and Sport with both being sold simply as Santa Fe.